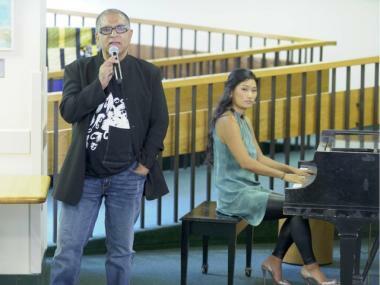 Deepak Chopra and Chloe Flower performed together at Memorial Sloan-Kettering Cancer Center on Aug. 16. The two are also collaborating on an album. MANHATTAN — Deepak Chopra is already considered a rock star in the world of spirituality and mind-body medicine — and now he's taking his clout to the music world. Chopra, the author of "Seven Spiritual Laws of Success" and other books, is working on a new album with New York-based pianist Chloe Flower and producer Kenny "Babyface" Edmonds. Chopra and Flower gave New Yorkers a taste of their musical talents during a trip to Memorial Sloan-Kettering Cancer Center Tuesday, where they performed for a room full of patients. As Flower tickled the keys, Chopra did a spoken work performance, reciting a Hebrew poem over the music of one of her four songs. "It was amazing," Flower, a Gramercy Park resident, said by phone after the event. "Music has the ability to activate certain regions of the brain that release dopamine and serotonin. I chose music that give you 'goose-bump moments.' I hope it worked." Before the duo performed, dozens of patients in their bathrobes were greeted by an introduction from fashion designer Tory Burch, who founded the hospital's "A-Team" of the Society of Memorial Sloan-Kettering Cancer Center, a volunteer-run fundraising group. Since 2009, Burch has been bringing actors, artists, authors, fashion designers and others, such as Lance Armstrong, Sheryl Crow and Vera Wang into the hospital's patient recreation room to speak with cancer patients and raise their spirits. "It was beautiful," Dr. Annette Rickel, a psychiatry professor at Weill Cornell Medical College who became president of the Society of MSKCC in June, said of Tuesday's performance. "Chloe played a lovely piece that was perfect for Deepak's recital of an inspirational Hebrew poem." The A-Team series brings special guests to cheer up patients on a monthly basis, she said. "I think it's important we keep this idea of integrating the physical with the mental," Rickel said. "It's so important for people to feel a sense of peace in what they're doing… and that they focus on getting better." Flower, a classically trained pianist who performs with a contemporary beat, had never played at a hospital before. But when she was a child, she was on the nursing home circuit. "When I was little — 4, 5, 6 years old – I would play nursing homes," she said. "I was terrible, but I loved doing it. The people in the homes would come every time." Flower teamed up with Chopra after meeting him at a talk he gave. On the album — which has no title yet — Chopra speaks over Flower's piano playing in interludes that guide listeners through three acts that travel from innocence to suffering and finally to hope and healing. A portion of the proceeds from the album, set to release its first single in October and the full record in January 2012, will go to the Somaly Mam Foundation to help fight human trafficking. Flower is also teaming up on a forthcoming book about the healing power of music for Alzheimer's patients with Harvard Neurology Professor Rudolph Tanzi.